Is Captain Kirk On Track To Play Hal Jordan? 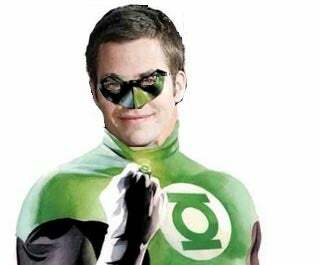 A shortlist of actors for the iconic role of Green Lantern/Hal Jordan went up on IESB, and everybody's fixating on Christopher Pine, who already has some experience playing cocky young proto-heroes in Star Trek. Even though I have a feeling Pine's "Why you talkin' to me, man?" drawl as Kirk may get a bit old after a while, he does seem to have the right ladies-man smirk, mixed with a dash of buffoonery, that you'd expect from Hal "head injury" Jordan. In other news, Martin "Casino Royale" Campbell is definitely on board to direct the film, and it's on track to start filming in Australia in mid-September. Campbell is on his way to Sydney and Melbourne next week with producer Donald De Line, to scout locations.